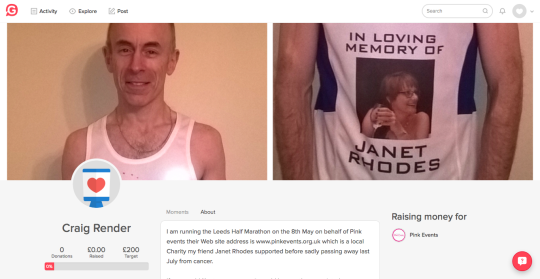 This May, the Leeds half marathon is being challenged by Craig in memory of Janet Rhodes and on behalf of Pink Events who Janet supported before her sad passing from Cancer. Aiming to raise £200 for Pink Events, this will provide and improve resources and equipment for patients and consultants to improve care, treatment and diagnosis of breast cancer. “Breast cancer effects many and through our own experiences we know that breast cancer effects not just the patients but families too. To learn more about Pink Events who raise funds for Breast Cancer Research UK. and the Leeds Breast Clinic at St. James’ Hospital, see their Givey page for further details.